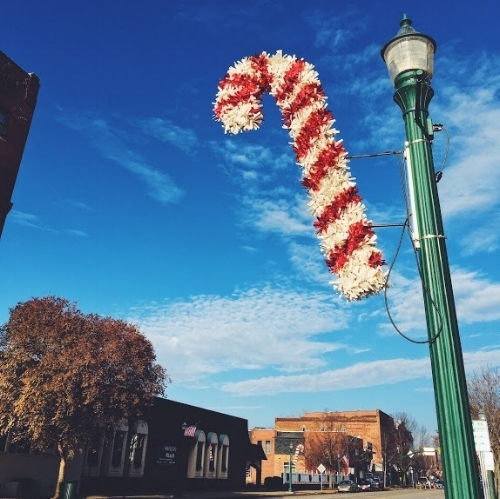 The Hometown Holidays Committee, led by Main Street Board Member and owner of Twisted Sisters Boutique Debbie Cline, set a goal of doing their best to raise enough money to decorate 100 lamp posts downtown with garlands, wreaths, and big red bows. "Our Committee is comprised of local volunteers who want Marietta to shine as bright as we can during the holiday season," shared Debbie Cline. 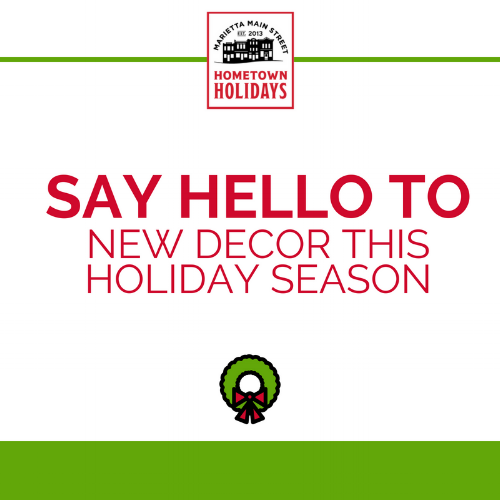 "Our focus is to provide our downtown with new decorations that uplift a fun, festive ambiance for locals and visitors to warmly experience the Christmas spirit." To meet a goal of 100 lamp posts would be to surpass the successes of the Raising Cane holiday decor fundraiser in 2012, where 75 canes were purchased for an investment of over $17,000 into beautiful city streets during the prime shopping season. A candy cane from the 2012 Raising Cane campaign hangs on Front Street. Not only did the Hometown Holidays Committee have their eyes set on newly-decorated lamp posts during the holidays, but on adding to the visitor experience with new events and attractions. "The Committee is eyeing a Santa Claus themed bar crawl, a gingerbread competition, and a Santa House on the weekends for families to get their picture taken with Santa right in the heart of downtown," said Cristie Thomas, Executive Director of Main Street. "We've also heard requests from the community for larger, more vibrant decor at the Armory. The holidays are such an important time for so many, and we really wanted to do our best to create a holiday experience our community can be proud of." With the Christmas in July fundraising campaign officially closed, the Hometown Holidays Committee with the Main Street Board of Directors are pleased to announce the results. The goal to have 100 lamp posts adopted was met and exceeded by eight for a total of 108 lamp posts adopted thanks to the generosity of 107 donors representing individuals, businesses, and organizations. The goal for larger, more vibrant decor at the Armory was met thanks to contributions by private donors paired with major gifts by Mister Bee. The community can look forward to a 22' majestic Christmas Tree bearing nearly 9,000 lights on display this holiday season starting mid-November. The goal for additional downtown attractions in the holiday spirit was met thanks to sponsorship by Jeremiah's Coffee House, coordination by the Mid-Ohio Valley players, and support from local volunteers. The construction of a Whoville-inspired village set will begin soon and be on display for families to walk through and take photos in cut-outs. The goal for a themed holiday season was met thanks to the Hometown Holidays Committee who reviewed holiday schedules of downtown Main Street communities across the U.S.. Ultimately, the choice to uplift a Dr. Seuss Whoville-inspired holiday season was selected, hoping to draw on the nostalgia of our older community members and tap into the excitement and joy felt by our younger community members. In partnership with the Kiwanis Club of Marietta, the Grinch will travel around downtown by surprise to greet shoppers. Pops of the holiday theme will be seen in our Hometown Holiday event lineup as well. The total investment by our donors, Board of Directors, and Hometown Holidays Committee is over $40,000, credited to downtown beautification, small business support, community pride, and preservation through celebration of our assets. For a list of our donors, check out the following link: Christmas in July.